Pinterest is amazing – I am constantly awed and inspired by what other people come up with, especially when it comes to food and cocktails. I personally love food and a good cocktail but I know I am not alone based on all those Pinterest pins on those topics. I have way too much fun (and spend way too much time) on Pinterest, but I am actually using it in a way that makes my life easier. I have discovered incredible recipes that I want to try and instead of looking through a billion cookbooks, trying to remember where it comes from, or searching for a page I tore out of Bon Appetit, I can simply go to my Pinterest Board. It is just so easy. Around the Holidays, people are even more astonishing in their creativity and invention. Not to mention food photography and styling skills – sometimes I want to reach in that picture to eat or drink the image. 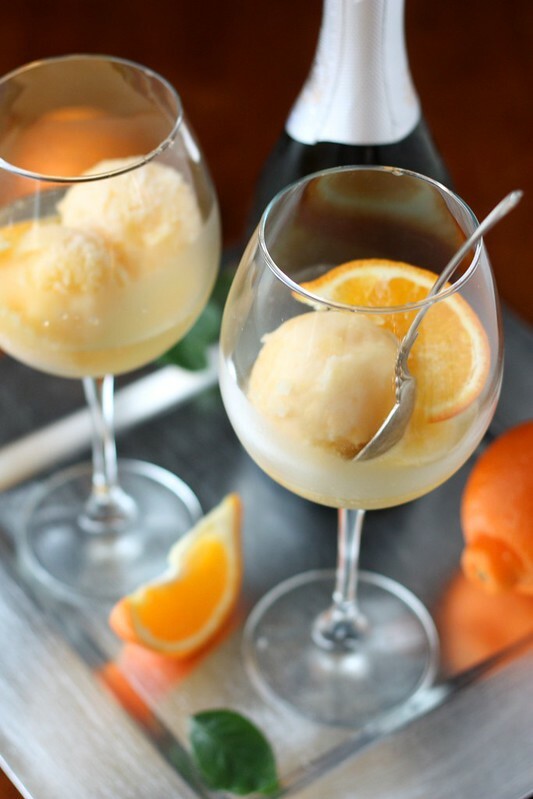 I recently came across a pin of Tangerine Sorbet Champagne Floats by Completely Delicious and knew I had to try it out. Luckily, being the Holiday season and all, I had a few bottles of Champagne in the fridge and one was conveniently open. So last Saturday while the snow beat down on NYC and SantaCon (if you don’t know what this is your lucky) roamed the city, I decided staying in watching Home Alone Two with friends. What a perfect time to try out this inspired drink. Her inspiring picture that started it all!